Greetings. For the week before Quinquagesima Sunday, I have released both a Podcast Homily for Quinguagesima Sunday and another episode in the AIC Bible Study series New Testament: Gospels and Epistles. Lancelot Andrews (1555-1626). Artist unknown. English school, circa 1660. Quinquagesima Sunday is the third and final Sunday in the pre-Lenten season and it hardly seems possible that Ash Wednesday is next week! The Podcast Homily is primarily focused on the Epistle and Gospel readings for the day, but I also mention the last verse of the reading for First Lesson for Morning Prayer, Deuteronomy 11:1 because it sheds light on St. Paul’s emphasis on Love as a primary virtue (Charity in the King James and Prayer Book readings, but Love (agape) in nearly all other translations. The Gospel lesson includes Jesus’ prophecies of His own persecution, death and Resurrection as well as St. Luke’s account of the healing of the blind man (identified as Bartimaeus in St. Mark’s account). I sought to add some context to Jesus’ reference to Prophets by including a lengthy reading from Isaiah and Psalm 22. 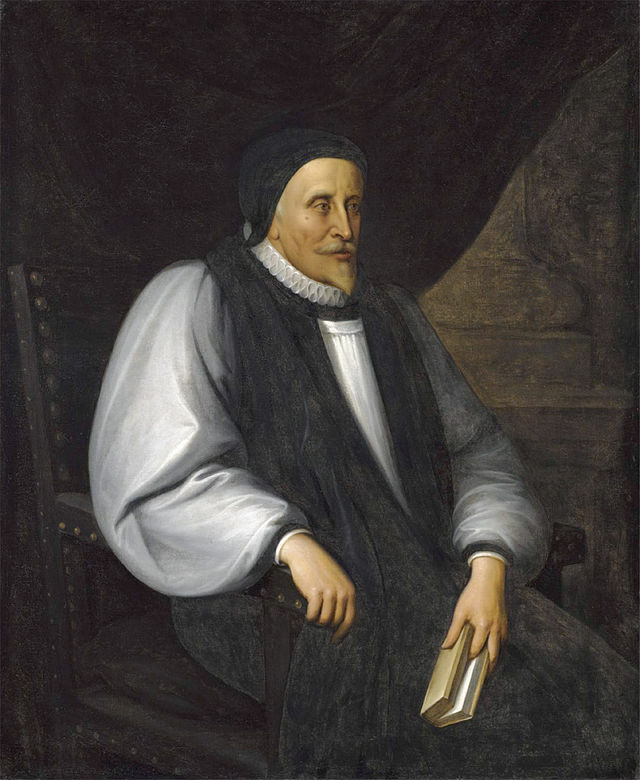 For admirers of the writings the great Anglican teacher and scholar, Lancelot Andrewes, I close with both the Collect for the Day and a long quotation from a Confession of Faith from the Private Writings of Lancelot Andrewes (using the late 19th Century translation now in the public domain), I don’t think Anglicans today give enough credit to the contribution Andrewes made to our understanding of the teachings of the Eastern Church. Listen to the Podcast Homily. 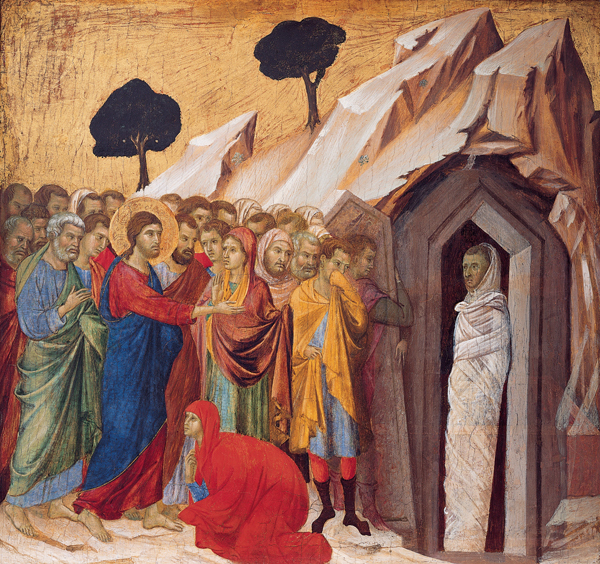 Raising of Lazarus by Duccio Buoninsegna of Sienna. Public Domain. Kimbell Art Museum, Ft. Worth, Texas. Raising of Lazarus. I was lucky to find a 14th Century illustration of the event by Duccio Buoninsegna of Siena, Italy. Duccio’s learned his art from a teaching in Constantinople and largely follows the Eastern style, depicting Lazurus arising from a cave and providing a background of stylized, craggy mountains, with the figures displayed with splayed feet. Yet his choice of colors for the robes of Jesus are in a shade of red and blue that would become popular in the Western Church after the Renaissance. His version is, I think, much more accurate than the far more familiar version by Peter Paul Rubens, which shows Lazarus rising from a grave in the ground (in the Western manner). The Raising of Lazarus, while not the only example of the raising of one thought to be dead (ie, the son of the widow of Nain and the Daughter of Jairus) the event St. John reports is the only example of a revival of a person not only dead but actually buried for four days. Take note that the man standing closest to the tomb appears to be holding his nose, indicating skepticism that there would be no stench of death. Watch the video of Episode 38 via our You Tube channel. I hope to complete the series on the Gospel of St. John during February and early March so that I can turn my attention to finishing the new series on the book of Revelation: Revelation: an Idealist Interpretation, in which I discuss Revelation verse-by-verse.